Snowshoes have long been a popular way for winter visitors to explore the deep evergreen woods that surround the resort community. But they’re also attracting interest from a growing throng of competitive runners, who trade in their sleek Adidas and Mizunos to race along the snow-packed trails crisscrossing the Northern Michigan outdoors. Traverse City isn’t the only snowshoe-racing venue in North American; in fact, there are about 100 races scheduled this winter in the U.S. and Canada. But the area has long been a hotbed for runners, who find snowshoe racing a way to stay in shape during the winter months. Snowshoe racing requires a lot of the same skills as warm-weather running – but there are also a few extra ones. Competitors find they have to lift their feet higher and keep their legs farther apart as they run, stay alert for changes on the surface, and try not to do a face-plant into a snowdrift. And there’s the added weight of the snowshoes themselves to consider. Racing snowshoes are smaller and lighter than the ones used for touring, and are tapered behind the heel to reduce the amount of kicked-up snow in each racer’s wake, but they’re still heavier than running shoes. The result is a phenomenal cardiovascular workout even at relatively low speeds — snowshoe runners typically burn over 1,000 calories an hour. It also means that most of them wear light clothing even on cold mornings, knowing that they’ll warm up almost immediately. Like most winter races, the Bigfoot is held in the morning (from 9 a.m. to noon) when snow conditions are usually at their best. 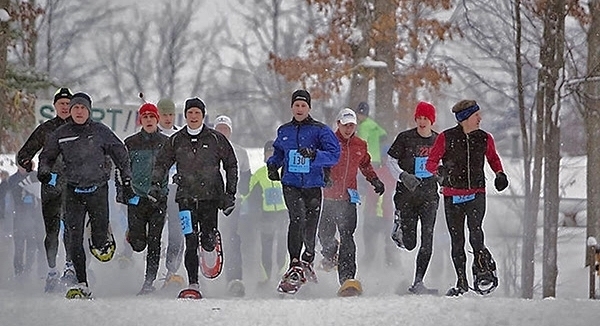 Racing snowshoes are available for rent to competitors who don’t have gear of their own. The race has never lacked for snow in its history, but organizers say they won’t cancel it even if this year’s unusually warm weather continues into 2016 – they’ll just turn it into a normal trail race. The Bigfoot is only one of several competitive winter events in the Traverse City area, which is best known for two classic Nordic skiing competitions: the Feb. 6 White Pine Stampede, which includes 10K, 20K and 50K loops in the hilly terrain of Antrim County, and the Feb. 13-14 North American Vasa Festival of Races, a two-day series of races held on its own sprawling trail system just outside Traverse City. Both are celebrating their 40th birthdays this year. For information about the Bigfoot Snowshoe Race (including a look at that trophy) click www.runsnow.com. To learn more about these and other winter events in the Traverse City areas, and for information about lodging, dining, shopping and other pastimes, contact Traverse City Tourism at www.traversecity.com.